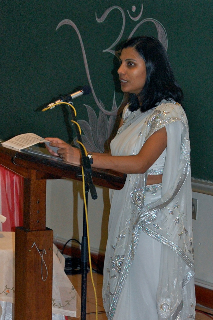 Ramola and Sravanthi as guest writers sent me a Report on the Seminar that had the above theme as title and hosted by Sri Sarada Devi Ashram, Asherville in commemoration of Holy Mother’s 156th birth anniversary celebration at KZN University on Sunday, 13 December 2009. It was a great success with 500 delegates from even distant places attending with enthusiasm. 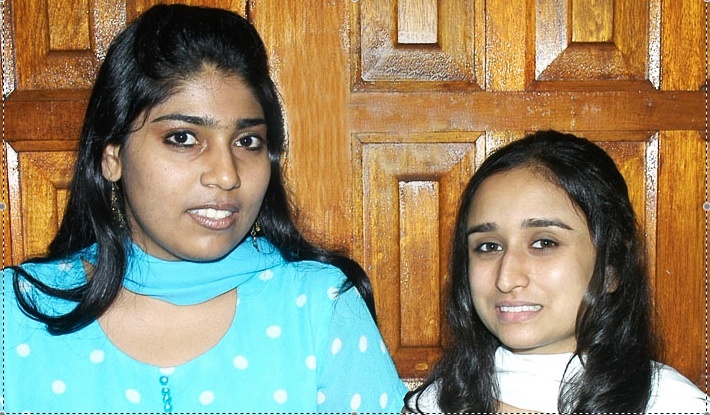 Photos courtesy: Lushen Pillay and Jaya Ramjogi. The 1st Part was posted on 1st Jan, 2010. Here is the 2nd Part! During the tea recess the delegates were lovingly ushered from the lecture room, T1, to the dining area in the ground floor foyer to partake of sumptuous refreshments. Upon entering the dining area they were welcomed with smiling faces of the members of the Sri Sarada Devi Ashram, who stood before rows of neatly laid chairs that were covered with white chair covers. The tables draped with white tablecloths and red and gold overlays were laden with delicious snacks, tea, coffee and juices, much to the delight of all. 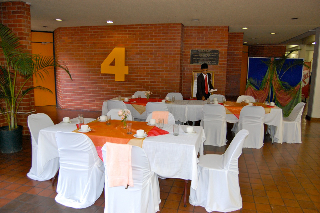 The dining area was further sanctified by the holy presence of Monks and Nuns of the Ramakrishna Order who also partook of refreshments here. The ambiance of the venue was further enhanced with the ladies of the Sri Sarada Devi Ashram in their uniform saris and the men in their red and white attire. After refreshments, the second paper was presented by Ms Raisha Singh, Campus Manager, Mnambithi FET College. In presenting her topic ‘Challenges of Parenting’, Ms Singh discussed in detail the various challenges facing parents today. Her description of the growth of a child with the simile of a young plant was apt. To grow into a healthy tree which will provide shade to many, the plant must be carefully nurtured with sufficient water, sunlight, nutrients and love. She also discussed current social concerns like rebellious children, suicide, teenage pregnancy, substance abuse and peer pressure. Methods subscribed in coping with these concerns included providing a stable environment in the home which will ensure emotional security, effective and frank communication with children, encouraging attendance at religious institutions, exposure to the finer sides of life like art and music, and lovingly disciplining children. Thereafter Sri Swami Vimokshanandaji Maharaj, President, Ramakrishna Centre of SA, released a booklet on ‘Parenting – A Hindu Perspective’, containing articles by the speakers as well as many interesting ideas on parenting skills. It was freely distributed to the delegates who attended the seminar. 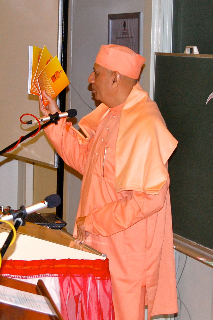 While releasing the booklet Swami Vimokshanandaji drew the attention of the audience to a normally forgotten point that parenting begins with the mutual desire of the parents to have a child and not necessarily only with the birth of a baby. He highlighted the value of prayer and a religious ambience to direct the pre-natal influence of the parents on the child. He also cited from our scriptures giving the incidents of Sita in sage Valmiki’s ashram when Lava and Kusha were still unborn and saint-child Prahlad’s mother at sage Narada’s ashram. Maharaj described the need for providing sincere appreciation and love to children as incentives for their healthy growth. He also stressed the importance of religious education to strengthen character and personality. The third paper was delivered by Dr HB Parbhoo, a leading medical practitioner as well as the General Secretary of the Ramakrishna Centre of SA. He addressed the issue of ‘Cultivating Harmonious Domestic and Social Skills in the Family’ in a remarkable way. 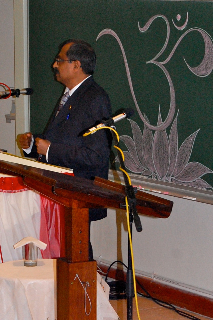 Dr Parbhoo spoke about the traditional Hindu home as being one of warmth and hospitality. Family members were united in a circle of love extending to include grandparents, in-laws and one’s community. This was contrasted with the modern family of today where nuclear families exist in isolation with individualisation of the family members and marginalisation of the elderly. Another pertinent issue he discussed was that of the difficulties that children experience in overcoming the influence of friends and following the right path. He quoted an excerpt from the life of Mahatma Gandhi, dealing with peer pressure. Dr Parbhoo stressed the importance of having appropriate role models, like Swami Vivekananda, as children by nature are hero-worshippers and would otherwise look to morally bereft celebrities to idolise. Dr Parbhoo emphasised the importance of belonging to a religious organisation as it encourages one to broaden one’s horizons and the selfish circle of one’s own immediate family interests, and reach out to others. He extensively quoted from Swami Vivekananda and concluded that the home setting needs to be a spiritual one. 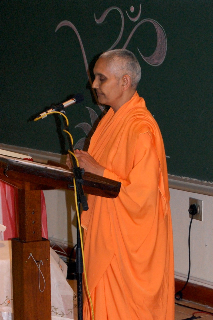 The final speaker, Pravrajika Divyanandaprana Mataji, a nun of the Sri Sarada Math, Dakshineshwar, near Kolkata, India, delivered a paper on ‘Swami Vivekananda’s ideas on Youth Development’. Analysing development according to Swamiji, the Mataji proceeded step by step to uncover the roots of human identity. Man’s identity, she declared, is rooted in his ancestry and anchored in his immediate family. She eloquently compared the parent to a bow and the child to an arrow and said it was the stability and direction of the bow that determined the direction the arrow would take. Further entering the mind of a child, Mataji showed the importance of inculcating proper cultural values and religious education in the sensitive mind of children, drawing appropriate examples from Indian history. Divyanandaprana mataji also touched upon the conditioning power of love, an inspired self-image and a dynamic work culture that the growing mind requires for character development. However human personality rests on the core truth of man’s inner Being called the Atman in Hindu philosophy. Dwelling on this, Mataji explored the role of the spiritual quotient in balancing the other aspects of the personality namely Intelligent Quotient and Emotional Quotient and how ultimately the SQ was the saving factor. In essence, it was an exemplary paper that exhaustively summarised the eternal principles of Hinduism in creating an enlightened society as envisioned by Swami Vivekananda. A question and answer session was conducted immediately after the presentation of each paper. These were efficiently and appropriately handled by the speakers. 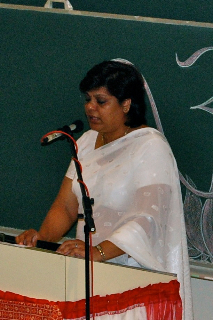 The Director of Ceremonies, Ms Prakashnee Gengan, extended a Vote of Thanks. 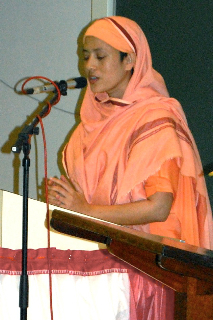 The programme concluded with closing prayer led by Pravrajika Ishtaprana Mataji. The Seminar helped to awaken the consciousness of the thinking community in upholding values in order to create a stable, secure and cultured social set-up. All the delegates were served lunch at the conclusion of the seminar. 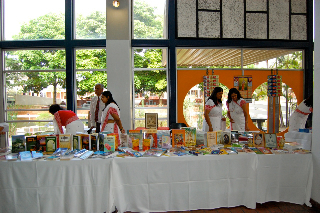 The Ashram’s ‘Vedanta Bookshop’ sold books covering a wide range of subjects including Vedanta, Ramakrishna-Vivekananda literature, scriptures like the Bhagavad Gita and Tirrukural, Meditation and Children’s books. For more photos of the Seminar please see the below slideshow. Next Post: Youth ‘Retreat’ – going ahead? As usual lot of new insights and spiritual knowledge are the HALLMARK OF “VEDANTA IN PRACTICE”. “Parenting begins even before actual birth of child” also reminds of the famous incident of Abhimanyu learning Art of Piercing into CHAKRAVYUH and not able to learn the Art of Coming out because his mother had gone to sleep! Maharajji replied, “Instead of teaching them something YOU SHOULD YOURSELF BECOME “LIKE SWAMI VIVEKANANDA”. This according to me is CORRECT PARENTING! Once again my humble pranaam. Well said! Swamiji places great stress on ‘Be and Make’. It is easy to understand this cryptic command when we fail in our attempt to ‘make’ others into something when we ourselves have not been made. Only a Vivekananda can make another Vivekananda. Many thanks, in this connection, for quoting wise words of Revered Akamanandaji Maharaj! It was very disappointing that we had to miss such an interesting seminar. Fortunately mom was able to attend. Maharaj! we are surely missing your holy company, being in your presence is so spiritually uplifting. I have been recently listening to Swami Tyagananda‘s talks.This made me realise that it has been such a long time since you have visited us in Newcastle. By Listening to these talks we learn more about our religion; this makes parenting a bit more simple. Indeed it is difficult to attend every program when you have a little child. But I presume a full video would be made available for those who are interested and I hope you can get a copy of it from SSDA. It is worth watching it. I am happy to note that you are listening to spiritual talks by utilising the internet for elevating purposes. By Holy company we not only mean the actual contact with holy people but also the recorded talks, books etc which are also included. Regarding my visiting Newcastle, I have left it to Master. One more great post in great series. I really like your blog, it makes my time more valuable. Parenting in Hindu Perspective is a new dimension in the eternal mystery of birth and development of child before it sees the light of the Earth. The great writer Valmiki had to design his story in such a way that Sita Devi had to be brought to the atmosphere of Ashram even before the birth of Luv and Kush. Doctor, Lalima, Surupa and me are all well by the grace of Lord Sri Ramakrishna. Kids are at Mumbai and Bangalore. Doc and I are at Jamshedpur. Happy to see your visit to this blog. Welcome! Yes, the Parenting seminar attracted lot of attention among the elite here. Our Centre does arranges seminar and conferences off and on in order to educate the general public on various issues. The twins Luv and Kush while in the ‘unborn’ stage itself had the opportunity to listen to the glory of Sri Ram, spoken by the sage Valmiki. It is highly advantageous for the ‘mother-in the making’ to hear or read about positive qualities like compassion, strength, enthusiasm, service etc. They have been found to make definite impact on the growing foetus where the subtle body of the unborn baby is getting form and shape. In our mythology there are of course many episodes that signify this principle. You may remember the story of child Prahlad who listened to sage Narada. The would be mother’s enriching herself with godly thoughts is a wonderful means to beget a worthy child. May the parents learn and teach their daughters these simple methods so that the family unit is happily settled in future!